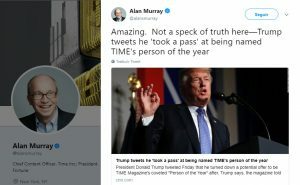 That statement was denied by Alan Murray Chief Content Officer, from Time Inc. 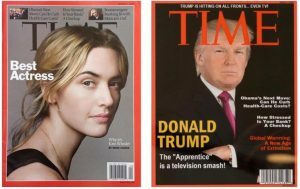 Being in the cover of TIME Magazine, has been a long-running obsession of Trump throughout the years and it goes so deep that in at least five of his golf clubs, from South Florida to Scotland, he hung a Time magazine cover featuring a picture of a cross-armed Trump with the words: “Donald Trump: The ‘Apprentice’ is a television smash!”. The Time cover was a fake. There was no March 1, 2009, issue of Time magazine. Actually, there was no issue at all in 2009 that had Trump on the cover. Kerri Chyka, a spokeswoman for Time Inc. said in an email to The Washington Post: “I can confirm that this is not a real TIME cover.” Trump who spent his entire campaign and has spent much of his presidency accusing the mainstream media of producing “fake news” was caught decorating his properties with literally a piece of “Fake news”. A spokesperson for Time asked the Trump Organization to remove the cover from the walls where it was on display. 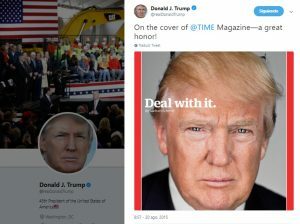 Between 2012 to 2015 Trump sent a multitude of tweets mocking Time for being “paper thin” and “really flimsy,” until 2015 when the magazine returned to Trump’s good graces when his out-of-nowhere presidential campaign landed him the cover. Well… Mr. Trump made the cover again. This time, with a powerful image of John Moore, a Pulitzer Prize-winning photographer who has been photographing immigrants crossing the U.S.-Mexico border for years, except this week one of his pictures became the most visible symbol of the immigration debate in the United States when his camera caught the reaction of a two-year-old Honduran girl crying desperate as her mother was being detained in McAllen, Texas. In Moore´s words: “All I wanted to do was pick her up. But I couldn’t. This one was tough for me. As soon as it was over, they were put into a van. I had to stop and take deep breaths”. 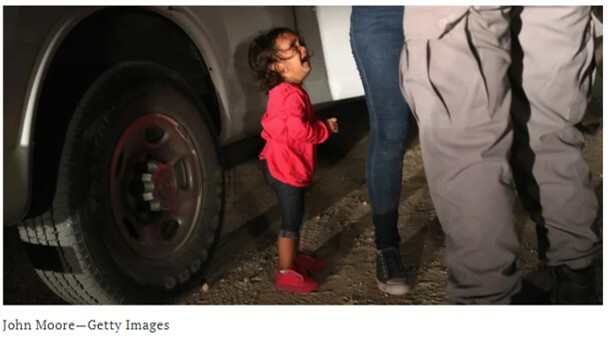 The powerful image, caused world controversy on President Trump’s now-reversed policy of separating children from parents who are being detained for illegally entering the United States and TIME’s editors selected Mr. Moore’s photograph to create a photo illustration of the July 2, 2018, cover of the magazine.